Emily Arkin is an artist from Somerville, MA--this handmade "filigree" deck is her first playing card design, and another new deck is in the works. She also works on the Web site for a scholarly publisher, plays guitar in the rock band The Operators, has designed a few album covers, and is an amateur animator. The card suit pips for this deck were based on a series of arabesque spirals she often doodles and were initially sketches for a tattoo design. 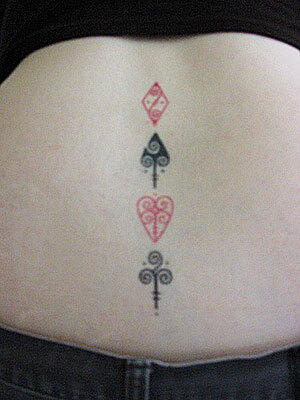 She had one tattoo of this kind: and was working on a larger card suit-inspired one (pictured at left; final tattoo was done by Pat's Tats), as she had long been an avid card player and card collector. Before she knew what she was getting herself into, the project had evolved into the design for an entire deck (pictured below). The filigree deck was originally hand-silkscreened with 3 ink colors (burgundy and black for fronts, sage green pattern for backs) on manila cardstock, and cut with pinking shears. The resulting cards were not completely uniform, but did have a lot of handmade charm and are good for stately games of solitaire. Later, for a "punk rock" craft fair, she produced a 3-color xerox version of the cards, which was quicker but a little less fancy. For more information on DIY reproduction--good for homemade cards and many other projects--try the Reproguide, an excellent resource by underground comic book/poster artists Ron Rege, Jordan Crane, Brian Ralph, and David Choe. And feel free to contact: [email protected].